LAFAYETTE, CA--(Marketwired - Mar 19, 2014) - As awareness of the perils of plastics grows, an eco mom business is responding with the release of a new plastic-free and ocean-friendly lunchware collection designed to help families pack lunch without plastic. "Lunchtime is a great time for families to think twice about their daily plastic habits," said Sandra Ann Harris, who founded ECOlunchbox at her kitchen table in Lafayette, Calif. five years ago to make available plastic-free lunchware that's healthy for people and the planet. "The toxins in plastic don't belong in our food, especially when it comes to kids," Harris explained, "and we don't need any more plastic littering our oceans, beaches and lands." The unique, aquatic-themed Blue Water Bento container is made from non-toxic stainless steel and has a food-grade silicone lid with an embossed blue wave. The silicone lid offers the "leak-free convenience of a plastic lid without the plastic," Harris explained. Silicone is a non-toxic and plastic-free material made from silica, which is also used to manufacture glass. 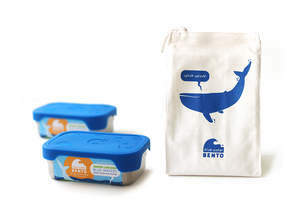 The Splash Box™ bento lunch box coordinates with three Blue Water Bento organic cotton lunch sacks featuring: a blue whale, a green dolphin and an orange sea horse. "It's really shocking how much plastic washes up on our shores," said Angela Haseltine Pozzi whose non-profit organization Washed Ashore builds large art sculptures from plastic marine debris to bring attention to the issue of plastic pollution in our oceans. "I love what ECOlunchbox has done with their new Blue Water Bento collection," Pozzi said, taking a break from installing sculptures at Sea World parks nationwide, "because it directly connects the dots between our behavior as humans and how using less plastic can help out the critters in our oceans and the environment in general." In recent years, the health hazards of bisphenol-A (BPA) and other plastic toxins have been well publicized. Scientists and doctors have linked toxins in the petroleum-based material to diseases, such as cancer, diabetes, and obesity. Environmental non-profits, like 5 Gyres, as well as major media reports, have also called attention to the accumulation of plastic debris in our oceans, such as the Great Pacific Garbage Patch, where plastic trash is hurting, poisoning and killing marine life throughout the world. "I decided to call the new line 'Blue Water Bento,' because I wanted to connect the plastic-free lunch theme with helping out marine life in our oceans," Harris explained. "When kids go to natural history museums, aquariums or other environmental centers, they often are learning these days about the big problems with plastics in the environment, like the Great Pacific Garbage Patch. That's great! It's important to open their eyes to these problems, but I think it's equally crucial families don't walk away feeling hopeless or powerless. "What we're trying to do with our Blue Water Bento collection is inspire people to 'do their part' by living life with less plastic," the San Francisco Bay Area eco mom entrepreneur added. "Everyone eats lunch, right? Why not start making change every day at lunchtime by packing a non-toxic and waste-free lunch?" With its colorful blue silicone lid and a humpback whale swimming across its packaging through information bubbles and ocean jokes, the look of the company's aquatic-themed Splash Box is decidedly more modern and contemporary than the classic artisanal ECOlunchbox line. It's currently available through the company's online store for pre-orders. "Packing a waste-free and plastic-free lunch is something that even the smallest child can do to start building a lifetime of healthy green habits," said Pozzi of Washed Ashore. "Our sculptures try to excite people around the idea of helping to save our oceans, but sometimes it's hard for families to know how to get started. I'm so happy ECOlunchbox is part of educating and activating people to use less plastic!" The new bento is expected to be available starting this summer through ECOlunchbox's distribution network, which includes The Container Store, select Whole Foods markets, independent natural grocery stores and children's boutiques nationwide. ECOlunchbox will also be seeking placement for the product in aquariums and natural history museums so families who have learned about plastics can go to the gift shop and buy a Blue Water Bento as a tool to help them green their lifestyles. Since ECOlunchbox was founded in 2009, the company has sold tens of thousands of their ECOlunchbox Three-in-One, Solo Cube, Tri Bento and other lunchboxes as well as ECOlunchpod and ECOdipper snack containers, various lunchbags and accessories. The lunchware sold has helped families avert millions of pieces of trash from the environment. "Over the years we have heard the need again and again from our community that they loved our 100% stainless steel lunchboxes - non-toxic, dishwasher safe, rugged, plastic free! What else could they dream for?" Harris said. "Loud and clear we kept hearing that families wanted a non-toxic and plastic-free lunchbox that was also leak-free. Now they can have their lunch and eat it too!" With its unique silicone lid, the Splash Box is part of ECOlunchbox's new plastic-free and leak-free lunchbox collection. ECOlunchbox is a green eco mom business specializing in eco-friendly and plastic-free lunchware, such as its new Blue Water Bento collection. Blue Water Bento is a plastic-free lunchware line by ECOlunchbox. The stainless steel Splash Box's leak-free lid is made from non-toxic silicone instead of plastic.